Label reading can be one of the most daunting aspects of following a low FODMAP diet. 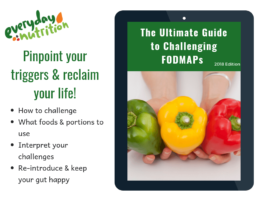 Many people find reading and interpreting ingredient lists somewhat overwhelming at first, because FODMAPs can hide in the most unexpected foods and under the guise of a variety of names. The good news is that with practice, most people find it doesn’t take too long before they are feeling much more confident about label reading, and choosing foods suitable foods all on their own! We’ve created a few key steps to get you started on the road to label reading like a pro. FODMAP Friendly logo: This is a registered certification trademark and products that carry this logo have been laboratory tested and shown to be low in FODMAPs at the manufacturers specified serve size. This logo can be used to safely identify low FODMAP foods. Now we start to delve into packaged foods that contain a number of ingredients (some may have a surprising number indeed!) as well as ‘contains’ or ‘may contains’ allergen declaration statements. Firstly, it’s helpful to know that the manufacturer must list ingredients in descending order, from largest to smallest. It’s also good to know that key ingredients need to declared in the percentage present. An example of this is ‘honey, 2%) in a ‘honey and nut’ muesli bar. Work your way down the list and use your app or dietitian notes to check the suitability of ingredients. This can take a lot of time to start with, but once you become more familiar with the process, you’ll build up a database of suitable and non-suitable ingredients in your memory bank, and find yourself being able to skim through quite quickly! NB. 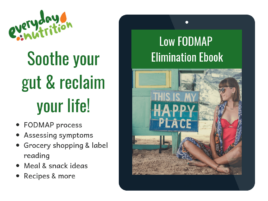 If you are just beginning the low FODMAP diet and following the Elimination or Challenge phase, we suggest avoiding foods that contain high FODMAP ingredients. If you are past these phases, you will have a good idea or which ingredients you can tolerate in small amounts and which ones to be wary of. Gluten free products are not always low FODMAP! Certain ingredients or additives will be denoted by unfamiliar sounding names and / or numbers. Many of these are fine! Onion, garlic, shallot and leek are often found in savoury products like soups, curry pastes, pasta sauces, marinated meats, flavour ‘sachets’ and simmer sauces. They will usually be listed as such, and should be avoided if present. However, because the onion family are not considered ‘allergens’ by Australian law, they do not have to be declared in plain English, and can masquerade under names such as ‘vegetable powder’ or ‘dehydrated vegetables’. We recommend avoiding these ingredients, particularly if they are higher up the ingredient list. Good news: All individual spices (eg. ‘cumin’) or herbs (eg. ‘oregano’) are low FODMAP and safe to include! Where an ingredient list simply declares ‘spices’, or ‘flavourings’ it becomes a little more murky. These are what we call “compound ingredients” because they are made up of other ingredients and listed under the one name. Labelling laws differ between countries, but in Australia, only ‘allergens’ have to be declared if the compound ingredient is under 5% of the product i.e. these may contain onion or garlic. It can be hard to draw the line between what is allowed and what is not on the Elimination phase, but at Everyday Nutrition, our advice to allow ‘spices’ or ‘flavourings’ unless high FODMAP ingredients are actually identified. The exception here is when ‘vegetable powder’ or ‘dehydrated vegetables’ are listed, as these usually do contain concentrated amounts of onion/garlic.